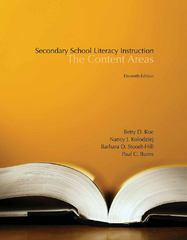 Secondary School Literacy Instruction 11 Edition Well known for its detailed and practical explanations of reading, writing, and study strategies, SECONDARY SCHOOL LITERACY INSTRUCTION is required reading for all non-literacy teaching majors. Its motivational pedagogy especially appeals to pre-service teachers, who quickly realize that the text will help them improve their students' progress. Two hallmark chapters on content area teaching have brought this text wide acclaim for its unique application of literacy and study skills in all secondary subject areas. The text also is recognized for its proven pedagogy, including "Meeting the Challenge," which puts ideas into classroom practice, and "Focus on English Language Learners" and "Focus on Struggling Readers," which highlight important applications for these special needs learners in easy-to-locate sections in each chapter. Available with InfoTrac Student Collections http://gocengage.com/infotrac.